Built around 2014, Wai’s house combines contemporary touches with traditional Carolina style. Located near Carowinds, the neighborhood is convenient to both uptown Charlotte and the engineering and tech jobs of upstate South Carolina. Wai is thrilled to be using solar energy. 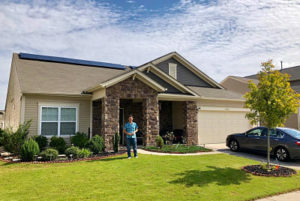 He’s gotten very familiar with the program that his utility company (Duke Energy) offers whereby any day when his solar energy system is producing more power than he needs, the excess gets sent onto the grid. 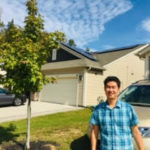 Wai’s happy he gets credit on his electricity billing account for all that power at full retail value, because that’s accelerating his solar savings. Under this program, with a solar energy system 6.3 kilowatts in size Wai expects to have nearly 100% of his annual energy offset with solar. With federal and utility incentives in place, great products available, and helpful solar professionals ready to assist you, why not do the same? Check out other stories of real Renu Energy Solutions solar customers, and get your own solar home assessment.